We just hang out all day talking and watching tapes. Two most interesting ones were My Big Fat Greek Wedding and A Beautiful Mind. It was a rollercoaster of emotions; the former was heart-warming and hilarious while the latter was intense, sad and dramatic at the same time. Learn more about Greek origins of English words and read a brief biography of John Nash. We took an early morning train to City of Bath as the weather got colder. By its name, I thought it's a nice flowery place with lots of hot steamy spa and and exclusive massage parlors. Far from that, the city is a tourist paradise in the shell of Roman buildings. On one side, there was the Roman Bath, Jane Austen's Museum and the Museum of Costume; on the other side there were Dorothy Perkins, GAP, H&M and Debenhams. (Note: Jane Austen, acclaimed author of many romance novels such as Pride & Prejudice, Sense & Sensibility, as well as Emma, stayed in Bath for 6 years. The Museum of Costume became one of the shooting locations for many scenes in the movie version of Austen's works.) We had a scrumptuous bar meal before heading back to Cardiff. That's the final climax of my trip to London and Cardiff. Okay, I missed my flight back too... Don't ask why.. I must be the worst traveler ever! Let's take a short interlude from my blogseries and take a look at the lyric of one of my favourite songs. Aparently, China has the oldest history in tea drinking. It was a myth how tea drinking started, but the culture is real and widespreaded. Lu Yu (陆羽), dubbed the sage of tea, was mentioned in the lyrics. He was most famous for his Classics of Tea (茶经) in which he classified an extensive list of different tea leaves and their distinct tastes. It's an unbeatable feat for a person to travel around the world on a thin horse and produce a book that untimately influenced the tea culture in the whole world (Japan, Britian, USA, Russia, India), neither for glory nor gold. Drink tea today and become part of the culture! Rev. Wyn Hughes is, by Jemima's personal account, a timid pastor, but when he took the podium that day his voice boomed. It's a mighty enthusiastic service he gave. He plucked one verse from the bible and evangelized on the meaning of Christmas. I was thinking.. he managed to give intricate accounts of the wise men traveling to ?? (I can't remember the place, but King David was the ruler there) without refering to the Bible at all. Well, I know the main gist is not about how they travel but about how they found Jesus in the end and worshipped Him.. I was just wondering, did he conjecture what happened or did he have reference somewhere else? Coz I'm pretty sure the Bible didn't say the wise men argued about following the shining star or going straight to ?? Just wondering... Anyway the service was a refreshing experience, and I don't mind going again. We had a smashing Christmas dinner comprised of stuffed turkey, roast potatoes, roast parsnips, brussel sprouts, pork sausages, yorkshire pudding, bread stuffing and turkey sauce. It's THE traditional meal and it's really nice. We spent the whole afternoon chatting and watching tapes. After the evening service (yes, I went back to the church again! Twice in a day! ), we hang out in Jemi's friend's apartment, had some roasted chestnut and played the pretender game. We're supposed to pretend to be something like 'angry' or 'sick' or 'rich man/woman', and the person picked to guess the adjectives had to see our actings and make conjectures. It was soo funny. What i remembered best was ben's cue when Yan Ling tried to figure out what were we doing. "the word starts with an F and rhymes with pickle." It's obvious enough, but her brain took a few minutes to register. Then she complained, "the word is not salient!" We all laughed. It was not long before we bid Yan Ling goodbye and went back to sleep. Cardiff (Welsh: Kaer-dith), the capital of the red dragon! I like its sky particularly; as opposed to London's cloudy vista, Cardiff's is filled with puffy white clouds and a nice azure gradient from Anakin's lightsaber blue to Levi's jeans blue. The Welsh capital boasted a huge castle right opposite the bus stop where we alighted. It was under construction/decoration for Cardiff's centennial year of establishment and 5 decades of the capital of Wales. Jemima picked us up and took us back to her apartment. It's warm and cosy with red carpets (! ), a nice common room stocked with marvelous blockbusters and a complete kitchen for the chef's work. It's a smashing place. We had conversations with Louis' dad, pertaining our country, our culture and the places he had been to. He taught us how to bargain in a Jamaican flea market, why the best cheese can only be found in France, what is to be expected on a holiday in South Africa etc etc. We had a good laugh when he teased Jemima and took photos of Joyce looking drunk on imbibing French coffee and blackmailed her. He's a good sport and managed to tickle my funny bones really well. Introducing... the Queens of Oxford Street! They achieved the amazing feat of conquering major outfit lines in the shopping paradise of London! How they manage it, that's something my Y chromosome can never comprehend..
H&M, Accessorize, Zara, Urban Outfitters, to name a few.. My memory aint that sharp enough to distinguish between a cardigan and a slack bottom, lest the names of those trendy fashion shops along Oxford Street. By the end of the day, I became familiar with Oxford Street and the art of shopping. To escape the maddening crowd that seemed to grow in Oxford Street in the middle of rush hour, we went to Harrod's 5 tube stations away. Other than its nice cheese scones and doughnuts, there's nothing else sold in the place that we can afford to buy. A normal woman's top which you can get for a decent $20 was priced 200 pounds; all top line shoes such as Jimmy Choo (he's a Penangite!) and other paraphernalia are tagged with extraordinary figures. Even its wet market (which was ironically dry and extravagant-looking with its high ceiling and chandelier and whatnots) sold a variety of poultry, dairy products, caviar, lavish pies and bakery products. I had just caught a glimpse of the lifestyles of the rich and famous. Took a late morning stroll in Kensington Gardens just a stone throw away. It's one of the 3 green lungs of London, covering a staggering area of 275 acres (about 1 km square!). One of the shooting scenes for 'Finding Neverland', the royal garden was filled with gigantic pine trees and lush verdant lawns, dotted sparsely by pigeons and canaries. On the contrary, numerous swans, ducks and migratory birds crowded in a serene lake in the middle of the garden. They are not afraid of humans at all. Habituation must have desensitized the defensive behavior so ardently shown by wild types. Walked to Albert Memorial at the south end of Kensington Gardens. It's a huge monument erected by Queen Victoria in dedication to her beloved husband, who, in spite of being labelled a foreign rogue trying to corrupt the nation, brought science and art together in Britain's manufacturing industry. I thought the monument is cool as it depicts different people from all around the globe in each corner and around its base, and Prince Albert is sitting on a golden throne in the middle, overlooking the whole world. Right across the road is the Royal Albert Hall, where Siti Nurhaliza had her first international concert. Wow. Walked on a bit. Imperial College loomed right in front of us. THE college for best engineering students. Awestruck. Walked a bit more. Entered Natural History Museum. Dumbfounded. It's a sanctuary for biologists, geologists, and plain earth lover. It's fantastically huge; we toured around for 2 hours but only managed to cover a third of the whole exhibition, that's how huge it is. I was quite disappointed we didn't manage to tour the Darwin Room in Life Gallery. Anyway, to be able to gape at dinosaur bones and scrutinize various rocks on earth was satisfying enough. Then, bro took us to a nice quaint Indian restaurant where we had the best nasi beriani ayam/kambing in London (of course, the best of the best is still beriani power! IMO). The rice was evenly cooked with cardamon, cinnamon sticks, cloves, and star anise; the meat was tender and juicy; the gravy was rich and fragrant. It was the nicest meal we had in London. Then, we travelled to West End of London where we treated ourselves with 'The Phantom of the Opera' musical in Her Majesty Theatre. It was just superb. I enjoyed the whole show thoroughly. I particularly liked the part when Christine was kidnapped by the phantom and she sang the shrillest part of the song in the musical; it was an adrenaline-rushing, octane-pumping performance. Kudos the the West End cast of 'Phantom'! This is my best birthday ever! The time was 10.20am. 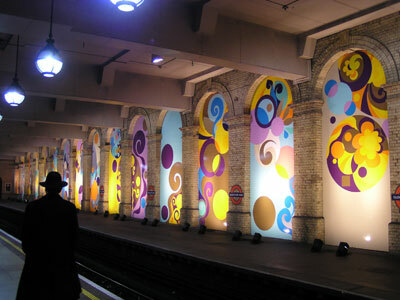 We were awefully late for an arranged meet-up with my bro at the tube station. After frantically searching for him around the area, we decided that he must have gone to Buckingham Palace on his own. Upon reaching the royal abode, where a sea of crowd had already congregated, we walked through the pavement, squinting our eyes trying to look for my dear bro. Where could he be? At last, we abandoned the search mission; the Changing of the Guard ceremony caught our attention instead. 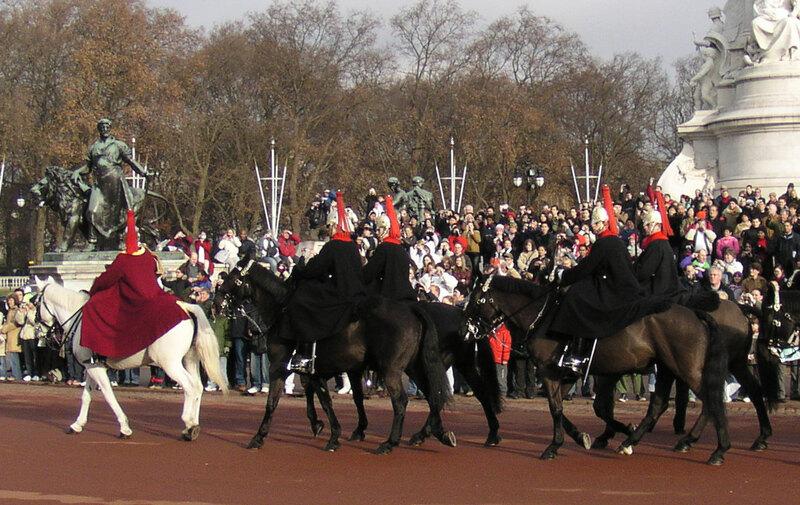 We took a number of photos and videos as a fresh contingent of royal guards marched into the palace ground, while the 'retiring' contingent went through a strict foot drill regimen and uniform checking. Same went to the new contingent before both contingents' commanders marched, stopped tete-a-tete, spoke few words, then marched back. At the same time, a contingent of cavalry entered the palace too. The crowd blocked most of my view, and after a while we gave up watching the rest of the ceremony. With my missing brother still in mind, I went to the nearest phone booth (the red iconic one) and called his dorm. He wasn't in. (Apparently, in my bro's story recount later, he was on his way to our hotel to look for us. Ouch!) So I just left a message asking him to meet up at the Meridian dial near Parliament Square after lunchtime. Luckily he received the message and reunited with us. The tour continued in Westminster Abbey. Hyped up by 'Da Vinci Code' fanfare, I was extremely excited to finally find myself stepping into the final showdown scene between Robert Langdon and the Teacher. The abbey was divided into chambers, each filled with tombs and carvings for the dead. We found a small stone labeled, hillariously, 'press to enter' in each chamber. It was magnificent, but I couldn't relate anything I saw to what I knew, save the tombs of Queen Elizabeth I and Queen Mary. Joyce was astonished to find that the crest of her college was crafted on a tomb, along with those of other colleges in Yale. It's soo cool. After that, we went to Trafalgar Square again. This time we managed to scrutinize the whole plaza. Bro noted a subtle yet major difference in the statues erected at each corner of the plaza. Instead of warriors on galliant horses, the statue in the eastern corner was a mortified little woman with deformed limbs. Bro said something about being a feministic symbol. I was enjoying the Christmas carol in the middle of the square though.. Soon after, we traversed to a hip area with lots of cinemas and musical theatres. We were near London's famous West End. We went into a souvenir shop and bought stuffs back for friends. I bought some t-shirts saying "My friend went to London and all I got is this LOUSY t-shirt!". Then we went to Chinatown! It was lively and busy and chinese-looking with the red lanterns and chinese characters on each shop, but the food was a tad exorbitant. We went to MARA cafeteria near Paddington Station instead for a nice malay meal! It was superb; how ironic that at this time last year I was so sick of Shah Alam's malay food. The man who emancipated slaves in this free country and realised public universities, example of which includes Purdue University, from laws of land development grants which he enacted during his presidency, Abraham Lincoln has always been my role model. 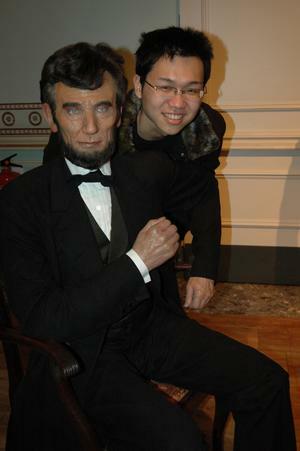 Not surprisingly, his wax figure was seated among famous counterparts around the world in Madam Tussaud's wax museum. Thanks, Mr. Lincoln! I was bedazzled by the presence of Julia Roberts standing behind a couch, with George Clooney sitting nearby with his outreached hand as if offering a glass of wine. Hugh Grant was standing across the hallway flashing his million-dollar smile; J. Lo was shying away from the Rock's glaring look; Brangelina became prince charming and wicked queen respectively while Jennifer 'Snow White' Aniston stood alone, looking forlorn; Bush and Blair acted cow. We even went to Live Chamber of Horror, a special part of the exhibition where notorious murderers and methods of execution were displayed. I personally thought that the walk through the dark tunnel filled with 'dead' walking corpses (they were actually actors) a bit cheesy and senseless, but the displays on guillotine, hang rope, infamous murderers and the French revolutionists' executions were amazing. I learned that Madame Tussaud, the little lady who started that museum, lived during the French Revolution and was responsible to take death masks of those condemned to death by decapitation. with her collection, she consequently had the idea of establishing a museum of famous figures of the world. To learn more about Madame Tussaud, click here. We had lunch at brother's apartment. He cooked cheesy chicken and spinach with white rice. Which tasted good by the way. Next, we toured St. Paul's Cathedral, built after the old cathedral was heavily damaged in the Great Fire of 1666. It's pillars, statues, tombs, and the majestic dome rising up to 150 feet tall, were all chalk white in color. Upon entering through the cathedral's vestibule, we were greeted with the sight of vast tiled floor, high ceiling decorated with golden linings, frescoes and Christian scriptures, windows with tinted glass, and huge tombs around the place. We attended the traditional Catholic Evensong, a service of singing hymns. I felt that it was too proper for me to follow. It was dark by the time the service was over. We walked across Thames River on Millennium Bridge and strolled around the area by the bank. It was filled with bars and, surprisingly, a prison museum. Bro was actually looking for London Bridge but we didn't realize we passed through it until a few miles later. Hungry but unfazed, we double backed and finally walked on London Bridge. Tower Bridge was just nearby. Satisfied of the tour for the day, we retired back to hotel and headed for slumberland. Flooded grandly in spotlight, the Big Ben and the adjoining Parliament building basked magnificently by the flamboyant Thames River. For more pictures, click here. Reached Heathrow Airport at 12pm. It was a really hectic time of the day, and by the time I emerged out of customs checkpoint I was thirsty and travel weary (due to 5-hour jet lag). Changed those familiar green notes into interesting multicolored pound notes and real heavy pences. I ended up with 150++ pounds. Thereafter, the eye-opening trip on the tube to Bayswater Station where Eden Park Hotel was situated showed the transversion of tradional English countryside to busy city outskirts to real hectic city center. The weather was great. No snow, no chilling wind. I felt out of place wearing my turtleneck sweater coupled with wool jacket, not to mention thick gloves and a beanie (it was really cold in Chicago). It's easy to find the hotel as it was just a stone throw away from Bayswater Station. After checking in, I called my brother but unluckily he wasn't in; On a second attempt, it got through. I was so relief to know that Joyce, Eric and Sin Yi were all under his care. Finally, we met up in the hotel lobby and had a proper rest. At night, after dinner at McD, we made a tour to Westminster District. Stepping out of Westminster Station, I was awestruck (yeah bro, you were right :P); Big Ben loomed majestically right across the street. The ancient sculptures and carvings on its wall encapsulated the mighty reign of King George's monarch. 4 round clocks with roman numerals surrounded the cap of the tower. Lit up with golden lights, Big Ben resonated with magnificence (btw, it was named after the bell residing in it). We took photos while we strolled across a bridge to the next big thing: London Eye. It's a humongous ferris wheel overlooking the opposite bank of Thames River. We didn't ride in it for 2 reasons: firstly, it was closed; and secondly, it costs 12 quid per person. Too much. On the way back we passed by a gallery showcasing Dali's masterpices. There were statues and carvings also. Although I'm not a big fan of his works, the statue of a man with a 'melted' clock on his shoulder and an ant on his leg was intriguing enough. Next, we walked back to the Parliament building adjoining Big Ben. It was closed though, but we made a discovery on the paveway opposite the building. There was a huge meridian circle carved into the pavement. There's a line in the middle, with all the 12 months situated at different positions on it. As solstice has varied lengths of day and night, both June and December occupied the 2 ends of the line, while equinox March and September are situated in the middle. It is said that if a person stands on the line in the position of the month he is in, he can observe not only the current time but also the length of day and night. After that, we went to Trafalgar Square by the famous double decker bus. It was a short cursory tour as we were all tired and our bladders full. Took the tube back to hotel, and bro bid goodbye, promising more fun the next day. This is the first part of my blogseries (as oppose to miniseries) regarding London/Cardiff trip. The photo shows Lafayette train station where I embarked on an unforgettable adventure. I'll never forget Amtrak. The name caused resonance of panic, anger and resentment. The blue and red emblem make me recoil ever since that nasty incident I experienced with Amtrak service which I'm about to tell now. My journey began with a 3-hour ride from West Lafayette to Union Station in downtown Chicago. I have 3 alternatives to get to my destination: Greyhound, ExpressAir coach or Amtrak. I chose the latter because it was the cheapest among all choices, and it proved to be reliable last time when Joyce came to Lafayette using the metal locomotive. It came on time. I happily boarded the train and, as it cruised steadily vertically across Indiana, I popped deeply into 'Pride and Prejudice'. After 2 hours, it suddenly came to a halt in the middle of nowhere. I stirred from the nuances of Longbourn and the Bennetts and looked around, noticing all the other passengers did the same thing too. Maybe it's just a regular halt, I thought. But after half an hour, I sensed that something was amissed. Confronting the ticket collector, I asked him why did the train stopped for so long. He answered, unsatisfactorily, that the train was changing crews. I was bamboozled. Why does a train need crew renewal in the middle of a journey? I went back to my seat. An hour passed. I was impatient now. The train had not even moved an inch closer to Chicago. I went back to the ticket collector again and demanded an explanation. Mopping his forehead, he said the train had stopped operating and 2 buses had been called to pick us up to Union Station. I was so exasperated to the point that I scolded him. I was so afraid of missing my flight. The buses would come in only 1 hour's time, and by then it would be too late. I called a cab company immediately. It charged $120 to get to Union station, and needed 30 minutes to send a cab to where i was. It's not a solution at all, but I had no other choice. After confirming the cab, I waited. And waited. And waited. My heartbeat and pulse increased every passing minute. The bus came 1 hour later and the cab was still nowhere to be seen. It's up to the bus afterall. No way I was going to catch my plane now. My last hope was to call studentuniverse and pray hard for 2 things: that there's another flight to London that day; and that i could still change my flight schedule. Thank God there's a direct flight to London that night at 10pm, and there's still a seat left. Paid $50 to secure the seat. But still, I'm pissed that Amtrak screwed everything up. Upon reaching Union Station, I went to its office straight away and complained. And guess what the lady behind the counter told me? "The train encountered some mechanical problem, and it was delayed. Things like that happen sometimes. There's nothing we can do. It's not like we planned it to happen. I'm so sorry sir. You can call this number (pointing to a leaflet) for customer service. Thank you." I found out later on that the crew on the train I was on had a strike and abandoned us. What a liar. After lunch, I walked around the downtown area, snapped some photos, and took the blue line to O'hare International Airport. I checked in 4 hours earlier in fear of losing the flight again. Peter and Boon Chuan called, and they were shock when I broke the news to them. Peter was worried I would be bored that he talked to me for half an hour. Talked to an old lady (heading for Santa Anna, California) for an hour. Read P&P for the rest of the time. Finally boarded the plane to London. An ardent fan of Star Wars, my bro downloaded a short audio clip of 'Stah Wars', a parody of Episode V by crazy Singaporeans. It reenacted conversations between Darth Vader and Luke after the famous hand decapitation scene. The funny part is, it's all dubbed in hokkien. 'Tek wa ki oh oh yi peng!' (跟我去黑黑那边！ come with me to the black black side!) never fails to crack me up. And the picture? It's too dark. Bad shutter speed. I was supposed to blog about my sojourn to London and Cardiff, but i procrastinated. It's new year again!! WOooHooo!! 2006 is here!! I had a pretty peculiar last day of 2005. I brought Benny to Tippecanoe Mall in the morning in hope to get a piece of ny eve sale. We got it. I bought a microfleece shirt for $9.99 (down from $34, which is a huge bargain). Benny bought the same thing too, plus a turtleneck sweater for $9.99 also. Damn cheap. Lunched at KFC. We suddenly had cravings for the crispy avian from the colonel. Too bad the buffet section was closed. I couldn't imagine how KFC could survive our onslaught haha.. Had half a chicken downed with pepsi. Went back just in time when Peter showed up. He's back from Milwaukee! We chatted while I prepared Yorkshire puddings with turkey gravy and some roast potatoes ala British style learned from Jemima. Both turned out great! After dinner Peter and I watched Gundam Wing: Endless Waltz. Not long after the seniors called for Dota!! My gosh. We played straight till 3am, not forgetting to greet each other 'Happy New Year!' at 12am while fervently slashing through the middle lane with my Tinker. Lol. Click here to see how other people around the world spend a more fruitful night than just playing Dota. And i'm going to blog about London and Cardiff after that. It's on my Post-it desktop note, and i'll make sure i won't forget.